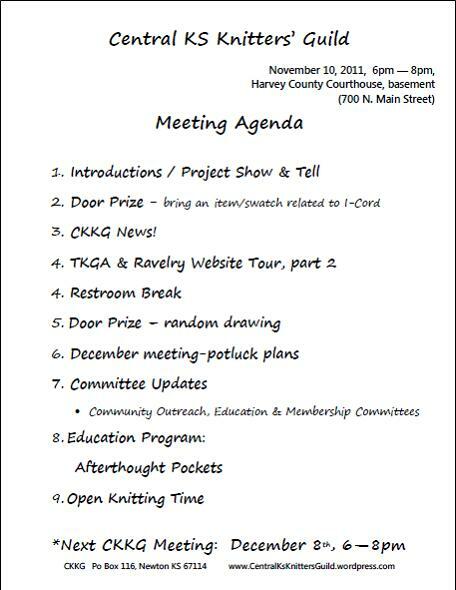 Join us for the monthly meeting of CKKG on Thursday, November 1oth from 6-8pm at the Harvey County Courthouse (Newton, Main & 7th streets). Don’t forget to bring your Grove Mittens if you are participating in the Knit-a-Long! I can’t wait to see the progress. Mine are working up nicely. Also, if you are stuck, check out the Ravlery group page for discussion notes. Never been involved in a Guild? Come check us out. Grab a friend, your knitting and come see what we are all about. We encourage everyone to bring a Knit Kit to guild meetings. Feel free to forward this to your knitting friends! Next Next post: November Meeting Recap! I’m going to join Thursday, so I’m just all happy. Didn’t have time for KAL just yet as too many projects backed up and overflowing, but just thrilled to be a part of this group of awesome far out coolio knitters. ❤ Thanks so much for all your work organizing and putting this thing together. I just really enjoyed taking part last month. It was so AWESOME meeting you (and then running into you on the Hop)! I’m so glad you were able to join us last month. Please let us know if you have any suggestions or ideas! Can’t wait for this Thursday!